Related report by VOA's Al Pessin, "Amid Public Concern, NATO Beefs Up in the East"
Thousands of NATO troops are on the move this month in Poland and the Baltic states, practicing sea landings, air lifts and assaults. The massive maneuvers on NATO's eastern flank that began in early June include the first-ever training by the new, rapid reaction “spearhead" force, and are NATO's biggest defense boost since the Cold War. Polish and Baltic state leaders have made it clear that they want to host large numbers of U.S. and NATO forces as a deterrent in the face of a resurgent Russia, and are welcoming the thousands of allied troops to their land and sea test ranges. Polish and Romanian leaders are even seeking more of a permanent allied military presence ahead of next year's NATO summit in Warsaw. “We must know how to defend ourselves. It is our goal is to assure a stable order," Polish Foreign Minister Grzegorz Schetyna said. “In the face of new, real threats, the biggest enhancement since the Cold War of the alliance's collective defense is taking place," NATO Secretary General Jens Stoltenberg told the Polish PAP news agency. He added that the spearhead exercise means to show that NATO is “ready and capable of facing every challenge and every threat." East European countries that took pains to shed Moscow's dominance almost three decades ago have been jittery ever since Russia annexed the Crimea Peninsula last year and began backing separatists in the deadly conflict in eastern Ukraine. They have urged NATO to show force as a deterrent. In response, all kinds of NATO troops are testing their readiness this month to react and cooperate in the face of a potential crisis in the Allied Shield exercise in Poland, the Baltic states and in Romania. Those nations had significantly downscaled their armies and defense spending since the Cold War, but now they want to be sure that NATO will defend them in time of need - especially Poland, with its memories of failed defense alliances at the start of World War II. Over 2,000 of the troops taking part in the Noble Jump maneuvers in southwestern Poland are from the Very High Readiness Joint Task Force that President Barack Obama and NATO leaders agreed upon at a NATO summit last fall. Multi-national drills are also being held at Poland's northwestern range in Drawsko Pomorskie, along with greatly scaled-up annual BALTOPS exercises on the Baltic Sea. 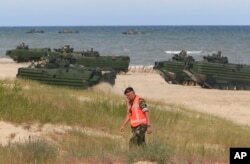 BALTOPS this year includes a spectacular amphibious landing of 700 allied troops on a beach in Ustka in northern Poland. Its maneuvers involve some 60 ships from 17 NATO and partner nations, but for the first time are taking place without Russia, which has its Kaliningrad military port on the Baltic. NATO troops make a massive amphibious landing during NATO sea exercises BALTOPS 2015 in Ustka, Poland, June 17, 2015. On Wednesday at BALTOPS, a Polish army amphibian sank while returning to its ship following the drill. Both crew members were rescued unscathed. A multi-nation corps in Poland's the Baltic port of Szczecin was doubling its staff to 400 this year to host the spearhead's command. Underscoring the maneuvers' significance, the exercises are to be visited Wednesday by NATO chief Stoltenberg and NATO's commander for Europe, Gen. Philip M. Breedlove, as well as Polish Defense Minister Tomasz Siemoniak. Russian President Vladimir Putin is not taking all this military activity lying down. On Tuesday, he announced a substantial re-armament program for Russia that, among other things, will add to its nuclear arsenal this year “over 40 new intercontinental ballistic missiles capable of penetrating even the most technologically advanced missile defense systems." Poland and Romania have been in talks to have U.S. army heavy equipment permanently stationed on their territory to speed up deployment in an emergency - since it's faster to ferry troops than tanks and howitzers. Romanian Defense Minister Mircea Dusa said two other East European countries were also in these negotiations but did not name them. The U.S. decision on placing heavy equipment is expected within weeks, Poland's Siemoniak said. Poland's President-elect Andrzej Duda, who takes office in August, says security guarantees for Europe are not sufficient enough. He plans to further encourage NATO and U.S. military commitment to the region on Moscow's doorstep. “A realistic thinking does not base itself on wishful thinking that peace will come on its own, but it is secured by mutual, hard security guarantees," said Duda's foreign policy adviser, Krzysztof Szczerski. The Polish public is divided about the NATO maneuvers. “I feel safer that they are training here, that they are ready to defend us,’‘ said Agnieszka Sokol, a 31-year-old housewife. “I don't think that that will anger Russia. But even if [it does], NATO is much larger, much better armed compared to Russia. So I don't think we have anything to fear." Not everyone is that confident. “I don't feel safe at all. I'm worried, seeing what Putin does. One move from him and we can have a war. It is really hard to say whether NATO would help in times of need," said Grazyna Sokolowska, a 57-year-old shop assistant.